Check out the latest SprezzaBox Coupon on My Subscription Addiction! SprezzaBox Exclusive Coupon – Get Your First Box for $10! SprezzaBox Father’s Day Sale – 30% Off Sitewide + 30% Off Your First Box + Exclusive Macy’s Boxes! SprezzaBox Memorial Weekend Sale – 25% Off Sitewide + 25% Off Your First Box! SprezzaBox Exclusive Coupon – Free Bonus Box with Subscription! SprezzaBox Coupon – Free Bonus Box with Subscription! SprezzaBox Valentine’s Day Coupon – First Box for $10! SprezzaBox Valentine’s Day Sale – 20% Off Store + 25% Off First Box! SprezzaBox Flash Sale – 50% Off Store + $10 Off First Box! Last Day! 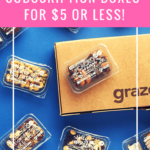 SprezzaBox Exclusive Coupon – First Box for $5!